Efter några dagar ville jag dock piffa upp det lite, så jag svampade på svarta Orly Liquid Vinyl lite lagom oregelbundet. 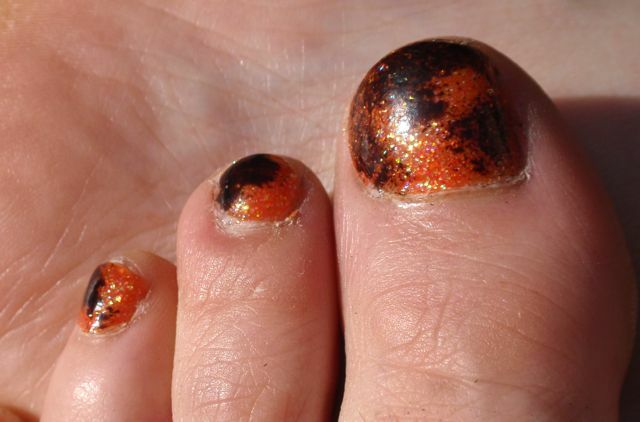 I firmly believe that summer toes should look happy and that taste does not have to be a factor, so at the moment my toes are a glittery popsicle orange! China Glaze Dreamsicle is from the glitter collection and I really like it. In fact, I have showed it before here. It was opaque in three coats and had a decent formula for a glitter polish. After a few days I sponged it with Orly Liquid Vinyl to spice it up a bit. Publicerat på augusti 1, 2011, i China Glaze, Diverse nageldekor, Orly, Pedikyr. Bokmärk permalänken. 2 kommentarer.